Circumstances requiring an Illinois business owner, or professional involved with a business, to engage in, or defend, a business litigation matter can arise out of a number of different business disputes. Business litigation matters often vary in levels of complexity, ranging from simple contact disagreements (e.g., breach of contract) to complex shareholder and partnership disputes. Illinois businesses, including partnerships, LLC’s, corporations and other entities, often face litigation with other businesses, partners, shareholders, members and other individuals, which require an understanding of the applicable law and the particular litigation issues involved. Our Chicago business litigation attorneys work on various types of business litigation matters, representing companies and individuals in connection with their most important business issues. Whether it be for a start-up or a private corporation, commercial litigation in Chicago can often be a long and costly effort for any business and its officers and owners. Our Chicago business lawyers appreciate that the involvement of legal counsel can oftentimes be the difference between a business that collapses from the pressures of corporate litigation and a business that aptly responds and cultivates economic stability out of such legal hardship. Our attorneys are sensitive to the economic and mental strains of corporate litigation, including gathering the necessary funding for legal fees. In turn, our Chicago business law firm offers reasonable billing options and flexible fees so that business owners can remain focused on the needs of their businesses, employees and customers. Our Chicago business litigation attorneys provide legal counsel to small businesses, inventors, professionals, start-up companies, entrepreneurs, and private corporations. Our law firm handles a range of corporate litigation matters throughout Illinois and other states including, breach of contract, business disputes, collection, trademark infringement, trade secret litigation, business fraud, and professional malpractice. Regardless of the proactive corporate planning and thoughtful negotiation of internal and third party agreements, business disputes are a reality of operating a business. It is inevitable that every business (and its business owners) will become involved in a business dispute and will be required to engage in the murky waters of business litigation. 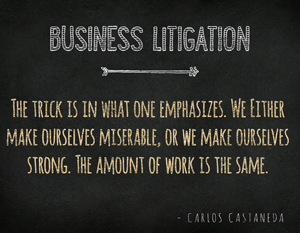 Getting involved in business litigation to resolve a business dispute is rarely a positive experience. Our attorneys understand that mediation and/or arbitration can often be powerful forum to reach a dispute resolution before the matter is litigated in court. Through mediation and/or the arbitration process, our Chicago business dispute lawyers can work with clients to find common ground with an opposing party in order to settle the matter outside of court rather than suffer the expense of a trial. If this alternative dispute resolution process isn’t enough, our attorneys are well-regarded for their courtroom advocacy. It is our law firm’s experience that contact disputes, whether oral contract disputes or written contract disputes, are often the most contentious issues to be resolved in litigation concerning a business. A breach of contract claim can (and often does) disrupt every aspect of a business, especially those businesses that are just starting up. Generally, a breach of contract dispute occurs when one party fails to perform a material term of the agreement. For example, failure to provide the services or product that was promised or failure to pay for the service or product provided are the two most litigated issues involving a contract disputes. The most common remedies for breach of contract are (1) money damages, (2) specific performance and (3) restitution or cancellation. Additionally, remedies involving business contract disputes often pursued by our Chicago corporate lawyers might include temporary restraining orders, preliminary injunctions, permanent injunctions and other equitable orders. Our Chicago business litigation attorneys are driven to resolve contract problems as quickly as possible in order to allow our clients to again focus on what is important – operating and growing the business. Shareholder and partnership disputes in the business litigation context can be quite complex and are often personal. In Illinois, a partnership is established when two or more individuals agree to carry on any business activity as co-owners. A partnership dispute may result from disagreements regarding the goals and direction of a business. Other partnership disputes may allege that a partner is not properly executing his or her obligations, duties, responsibilities and fiduciary duties owed to the business – see self dealing, mismanagement and fraud. Similarly, corporations have shareholder agreements, buy/sell agreements, bylaws and other corporate agreements that provision for the sale and transfer of shares, how to calculate the value of the corporation, separation, death, dissolution, among other things. Most often, especially in closely held corporations or family corporations, disputes arise when a shareholder seeks to leave the corporation, the shareholder is not performing certain obligations, the shareholder has caused damage to the company, or when there is not a market for the sale of a minority shareholders interest in the corporation. Shareholders and partners often are also employees of the business in which they own interests. Complications and business disputes often arise when one partner or shareholder has had his or her employment terminated – see wrongful termination. Our Chicago business litigation attorneys understand that a shareholder or partnership dispute can be a very personal affair, often affecting personal friendships and professional ties. We therefore make it our mission to address partnership disputes swiftly and efficiently, so that our clients can put the dispute behind them and expeditiously return to managing the business and its internal affairs. When a business dispute involves theft of trade secrets, infringement o trademarks, breach of employee agreements, among other issues, simple monetary settlements often are not enough to make the damaged party whole. For example, when a partner, shareholder, member, officer, employee or independent contractor steals a businesses’ client list or other other trade secret, it often becomes a business emergency and the owners are looking for more than just money to be made whole for the damage. In these situations, our Chicago emergency business litigation attorneys may seek to pursue certain injunctions, such as a preliminary injunction or a temporary restraining order (TRO). Our attorneys counsel clients on how and when to use injunctions and TRO’s in relation to asset protection, trademark infringement, trade secrets, restrictive covenants and other emergency business disputes. Our Chicago business litigation attorneys have decades of combined experience with handling many different business litigation and corporate dispute matters throughout Illinois. To schedule a consultation with one of our lawyers today, please contact us online or give us a call at 312-789-5676.